With iOS 5 and iCloud service – automatic downloading of content to different Apple devices functionality should be live very soon. We have already seen easy procedure to enable icloud automatic downloads in iPad and iPhone iOS devices. You can also activate this feature in iTunes installed on your MAC or Windows computer. Latest iTunes update adds few new options that you can enable and configure for using iCloud automatic downloads service. 1. Open iTunes on your MAC or Windows computer. First make sure iTunes software is updated to latest version. Goto Help > Check for Updatesoption – you will get prompt to install updates (if you are using older version of iTunes program). 2. After updating iTunes, goto Edit > Preferences option to open Preferences dialog box. Click on Store tab on the preferences window. 3. Click to check Apps, Books and Music(only available to US users) options to enable automatic downloading feature. Once these are enabled, from now on – when you make a purchase from the iTunes Store on your iPod touch, iPhone, or iPad, the purchased item can be automatically downloaded to your computer the next time you open iTunes. 4. 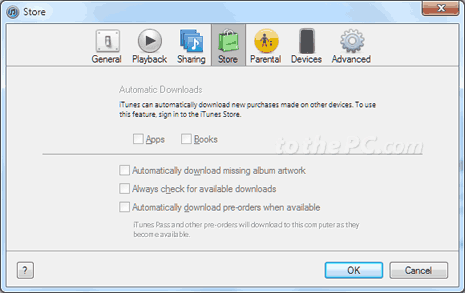 Also click to check “Always check for available downloads“, this will allow iTunes to display number of items you previously purchased from the iTunes Store but did not download. 5. You can also enable option to automatically download pre-ordered items when available. This will automatically download items you pay for in advance, such as new episodes of a TV show you purchased with a Season Pass, as they become available.